Bringing music and recovery into our prisons: Jay Dow talks about his journey as a musician, addiction, recovery and finding his purpose in life. 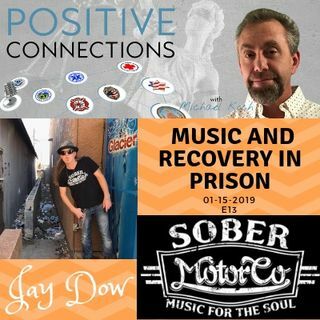 Jay is the founder of Sober Motor Company and provides a music workshop on addiction for those who are living in rehabs, sober living, jails and prisons. Jay is a part of the leading group of like-minded individuals who are bridging the gap between addiction and the societal stigma placed on mental health issues. I would like to say thank you for sharing this, also huge thank you to Jay Dow and the Sober Motor Company for starting this tour. My brother was just released from ASPC Tucson Manzanita, & informed me of all that you guys are doing to bring positivity & sobriety into the prison system. I also want you to know that he is very greatful & wants you to know that you had a very positive impact on his life.